You have collected your new puppy from the breeder and have survived the rather traumatic drive home. Puppy will no doubt have been fed and watered en route resulting in wet laps for all passengers that carried him. He would have pined for his mother and completely ignored the cosy nest you had ready complete with teddy bear to cuddle and hot water bottle to keep him warm. In hindsight you should have asked the breeder to leave his blanket in with his mother and siblings so that he had a comforting and familiar scent with which to travel home and sleep with for the first few days. Remember this will be the first night your little puppy has slept alone up until now he has had his brothers and sisters for company. To suddenly turn out the light and leave him will result in a sleepless night for the whole household. It’s also not safe to plonk him into a new dog bed and expect him to settle. Therefore a little forethought is needed before you even go collect the new edition to your family. It is not uncommon for dog owners to fit CCTV into outside kennel areas so that safety can be observed at all times. It is not unknown for dogs and puppies to be the target of thieves who can make a good profit selling on puppies or older dogs for breeding and fighting. Kennels should also be cleaned regularly and checked for signs of vermin. Puppies can be at risk from foxes in the same way that poultry can, so all fencing should be strong and robust. Most dogs will live in the home with their owners so some ground rules should be observed from day one. Where will the puppy sleep? He must have his own space even during the day where he can retire to for some peace and quiet. These days more and more dog owners are purchasing cages (also called crates). The dog is not to be shut in this for long hours during the day but can be used as a ‘safe’ place to sleep and to be left. Look around the room your dog is to live in, there will be electricity plugs, cables, wooden table legs and other exciting things to play with and also chew. A cage makes perfect sense! It would be prudent to line the cage with newspaper and then a warm fleece. In order that your puppy accepts his sleeping quarters feed him in the cage and leave the door open so that he can come and go as he pleases, this way when you lock the door he will not complain and the household will get a good nights rest. Never leave food in the cage as he may choke, or long leads and collars on the puppy for him to get caught up and possibly strangle while he is alone. Cages should be large enough for the dog to stand and walk around in, Many sizes are available and at a reasonable cost. 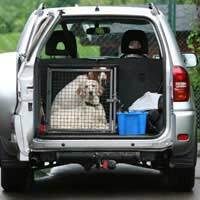 The cage can also be placed in your car for a safe journey while travelling with your dog.